The answer is that a new Washington media have evolved, but they are far from the more egalitarian or citizen-based media that advocates of the digital age might imagine. Instead, this new Washington media cohort is one substantially aimed at elites, often organized by industry, by corporate client, or by niche political interest. It represents the dramatic expansion of a once small niche sector of the Washington press corps—a group that as recently as a decade ago amounted to a couple of Capitol Hill newspapers that covered the nuts and bolts of Congress for staffers and lobbyists and a disparate collection of trade magazines and print newsletters that tracked narrow issues for those working industries ranging from aviation and health care, to energy and construction. For the most part, mainstream media journalists—and much of Washington itself—looked down upon the work of these publications as both boring and peripheral to the “real” challenge of covering Washington politics. The dream of many niche sector journalists was to land work with a major mainstream outlet. Not any more. Today, many of Washington’s most experienced and talented journalists no longer explain the workings of the federal government to those in the general public, but to specialty audiences whose interests tend to be both narrow and deep. These are publications with names like ClimateWire, Energy Trader, Traffic World, Government Executive and Food Chemical News. Their audiences vary, but most readers find the content increasingly important—even crucial—for their job, their business and their industry. Because of this, readers—usually with employer support—are willing to pay significant subscription fees—high enough that some are profitable with small readerships and little advertising. 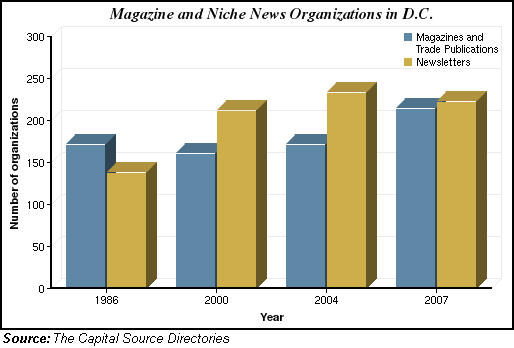 The number of niche publications in Washington has been rising since the 1980s. Hudson’s listings of specialty magazines, newsletters and periodicals, for example, jumped up by roughly one-third between 1985 and 2008 and by nearly 20% between 2004 and 2008. According to the 1986 Capitol Source Directory, 138 newsletters had Washington bureaus or staff. In 2007, that number was 223, a rise of 61%. The number of trade publications and magazines rose 24% during that time, to 214, up from 172. The listings in a different directory, Hudson’s, puts the growth of niche publications generally since 1985 (including newspapers, magazines and newsletters) at 48%. Today, it is the niche, not the mainstream, media that blanket coverage of Congress and other important arms of the federal government. And the reports today are not only daily but often more instantaneous than that. Among the biggest and best known is Bloomberg News. The news agency offers some coverage that the general public can see on its website or via aggregators such as Yahoo!, but its bread and butter is a top-line base of about 275,000 clients worldwide, which include financial institutions, business groups, government agencies, well-to-do individuals, or anyone else with economic interests and a willingness to pay $18,000-plus a year per lease for the terminal needed to receive the service. The company, which had no regular presence on Capitol Hill in the mid-1980s, had 112 staff members accredited in 2008, close behind the 134 of the Associated Press. It also has experienced, respected beat reporters covering key federal agencies, including the Pentagon, the State Department, Treasury and the White House. Its White House correspondent, Edwin Chen, who once covered both Congress and the president for the Los Angeles Times, will become president of the White House Correspondents Assn. in the spring of 2009. Most of these publications are far less known to the general public. Over the past decade, for instance, Environment & Energy Publishing has grown from a print-only weekly dealing with environment and energy legislation in Congress put out by a handful of reporters and a readership of about one thousand. Now, it’s a stable of six editorial online products, including a daily webcast that carries interviews and analysis with influential figures in the energy and environment field. The group’s first foreign bureau—in Brussels—is scheduled to open in early 2009, and a second in Asia is planned within the next year. The combined readership is just 40,000. The growth of this niche media has been fueled by a perfect storm of events—a dramatic rise in federal spending and an accompanying jump in potential readership concentrated in and around Capitol Hill and the offices of K Street lobbyists that value the information produced by these publications enough to pay the full cost of gathering it. Meanwhile, rapid IT advances allowed publishers to create niche online publications that could deliver information faster, at lower costs, to ever more targeted audiences and make a profit. A good example of this explosion is the growth of Congressional Quarterly, Inc., better known as CQ, which began life in 1945 with CQ Weekly, a magazine devoted to comprehensive coverage of events in Congress. Ironically, the magazine was launched by its founders, Nelson and Henrietta Poynter, in an era before regional newspapers opened bureaus in Washington as a way to provide newspaper reporters and editorial writers with information about the actions of members of Congress from their districts and states. Today, CQ has a very different role. With an editorial staff of about 165—roughly twice that of eight years ago—it provides content for an empire of 38 different editorial products, including CQ Moneyline which tracks the flow of money in politics; BNN White House Bulletin which provides a daily rundown of events around the presidency; CQ LawTrack, which traces how pending legislation might affect existing laws; CQ HealthBeat, which tracks, analyzes major health care issues before Congress; and Committee Amendment Text, which provides scanned sources documents on all available amendments to pending legislation. Another case is the Platts Division of the McGraw-Hill Companies, which once comprised little more than a daily oil pricing service and a two-page print newsletter of developments in the oil industry. Today, Platts has 15 different editorial products providing information to those working across the energy field, including natural gas, electricity, nuclear power and coal. Most of them consider Washington reporting crucial to their success. One biweekly newsletter called Inside NRC, with a basic subscription price of $2,495 per year, reports on developments in the important, yet arcane, subject of the nuclear power industry. As the newsletter’s name implies, its primary focus is the Nuclear Regulatory Commission, a federal agency covered by no mainstream media as a full-time beat. If there is a ground zero to this growth of niche media in Washington, it is Capitol Hill, where publications such as Roll Call, The Hill, Politico, the National Journal and CQ jostle for an edge in reporting even the smallest details affecting a legislative proposal, tidbits of insider gossip, or whiffs of political deals, whether formal or informal. Many of these publications have been reporting events on Capitol Hill for decades, but unspoken gentlemen’s agreements that long defined a series of spheres of dominance tended to discourage direct competition—until IT advances and the prospect of major profits transformed the environment into a competitive free-for-all somewhat akin to a 1930s New York City newspaper war. Roll Call, which began life during the Eisenhower administration as a weekly newspaper covering the politics and policies of Capitol Hill, today publishes four times a week when Congress is in session and supports a lively website, RollCall.com. Last year, the group purchased a legislative tracking service called Gallery Watch, which, in turn, spawned both an online wire service (CongressNow) and a centralized policy and document intelligence service (Briefing Room). In February, 2008, Roll Call joined with Comcast’s CN8 network to launch Roll Call TV, whose programming is also focused exclusively on developments in or around Capitol Hill. Other established Capitol Hill publications, including National Journal and The Hill, have grown at a similar pace over the past decade. In January, 2007, the competitive temperature rose further with the launch of an ambitious start-up called Politico, a print and online newspaper armed with some of Washington’s most respected print reporters and an aggressive, yet less formal style of journalism. Its mandate: to tell a more textured, in-depth story of life in three specific areas of Washington’s political life—in Congress, in and around the 2008 presidential campaign, and in the lobbying industry centered along Washington, D.C.’s K Street. In less than two years, Politico’s staff and circulation have roughly doubled, its print edition will go from three to four times weekly and, according to managing editor Bill Nichols, its goals for the future include becoming the ESPN of federal politics.